A most interesting development was announced this week, for very large wind turbines for offshore application, where the turbine blades flex and fold under high wind speeds to prevent damage. The blades will allow wind turbines to produce 50 MW each, a far greater amount than the 8 MW that is achievable today (to the best of my knowledge). With wind turbines, economy of scale applies (unlike in nuclear technology), so that bigger and bigger turbines have lower and lower unit-costs and power production costs. see link to "Enormous Blades for Offshore Energy," by Sandia National Laboratory. The photo at right shows the blades in the normal operating condition, fully extended and notable for the wind coming from the left, or the nacelle direction. 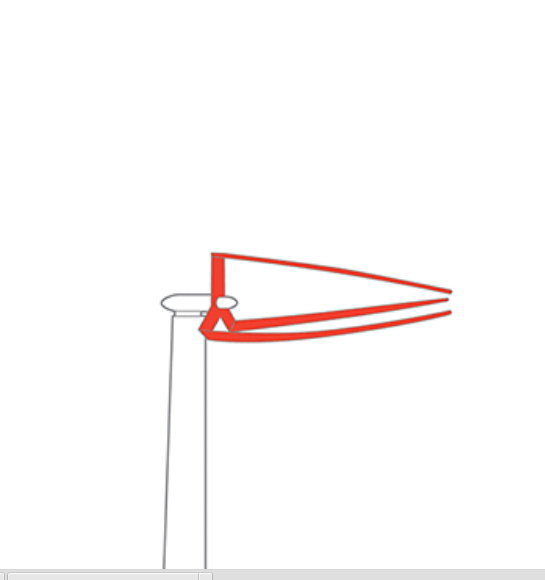 The blades flex as required in the wind, and move away from the support tower. 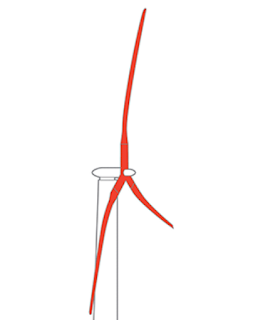 The large blades capture more energy from the wind, but must be supported on taller towers. However, the wind is faster and more stable at higher elevations, both excellent things in the wind-turbine business. 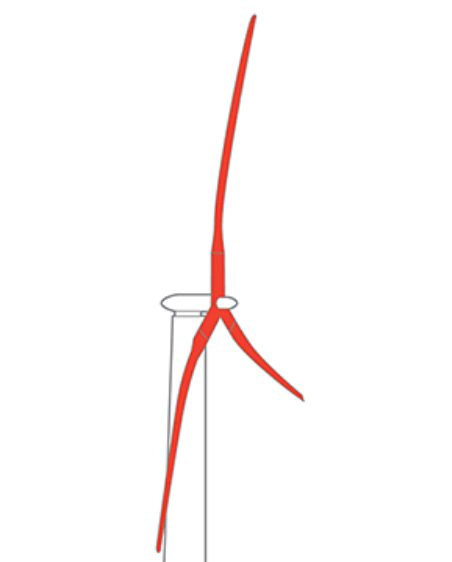 When the wind exceeds a certain threshold, the turbine blades begin to flex. 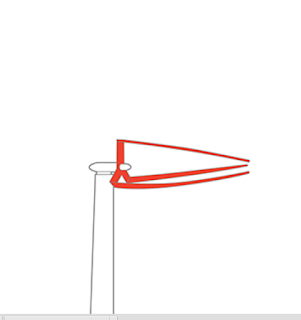 The flexing decreases the apparent diameter of the blades, and decreases the power output. However, at very high speeds, the blades collapse as shown in the next photo. The collapsed position prevents damage to the blades and generating machinery. "The segmented rotor's load alignment is inspired by the way palm trees move in storms. The lightweight, segmented trunk approximates a series of cylindrical shells that bend in the wind while retaining segment stiffness. This alignment radically reduces the mass required for blade stiffening by reducing the forces on the blades using the palm-tree-inspired load-alignment approach. Segmented turbine blades have a significant advantage in parts of the world at risk for severe storms such as hurricanes, where offshore turbines must withstand tremendous wind speeds of more than 200 mph. The blades align themselves to reduce cantilever forces through a trunnion hinge near the hub that responds to changes in wind speed. “At dangerous wind speeds, the blades are stowed and aligned with the wind direction, reducing the risk of damage. At lower wind speeds, the blades spread out more to maximize energy production,”"
Advances in tower technology are also being made, to reduce costs and achieve longer life in the offshore environment. For background, the US offshore locations have tremendous wind energy that is untapped, and has been untapped for millenia. Per the U.S. Department of Interior, Mineral Mining Service, MMS, in their January 2009 "Draft Proposed Outer Continental Shelf Oil and Gas Leasing Program 2010 – 2015," there is plenty of power in the wind offshore. “The U.S. Department of Energy (DOE) estimates that more than 900,000 megawatts (900 GW), close to the total current installed U.S. electrical capacity, of potential wind energy exists off the coasts of the United States, often near major population centers, where energy costs are high and land-based wind development opportunities are limited. Slightly more than half of the country’s identified offshore wind potential is located off the New England and Mid-Atlantic Coasts, where water depths generally deepen gradually with distance from the shore. Development of offshore wind energy technologies has the potential to provide up to 70,000 MW of domestic generating capacity to the nation’s electric grid by 2025." Furthermore, as stated many times on SLB, the variable output of wind turbines is no longer an issue, with the underwater storage and on-demand production of electricity as proposed by MIT. In short, there is absolutely zero need to consider dangerous, costly, and deadly nuclear power. The entirely renewable, clean, and inexhaustible wind has more than enough energy to supply the future needs. As Dylan once sang, "The answer, my friend, is blowing in the wind."